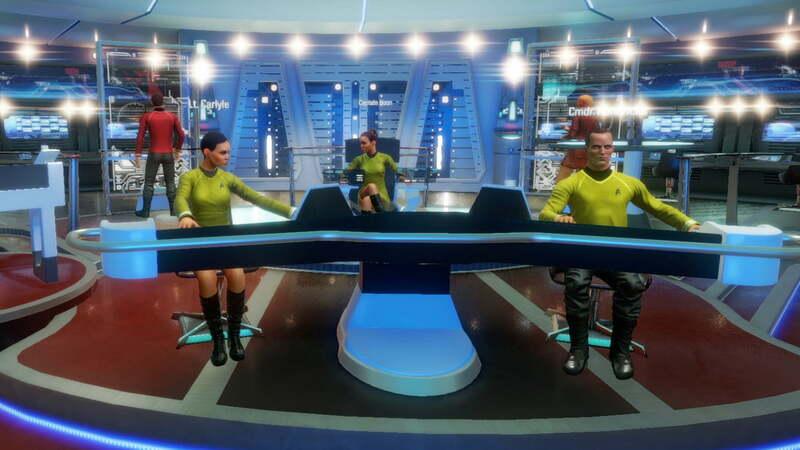 Star Trek: Bridge Crew might just be the most exciting VR game in the universe. “Shields u-” the captain’s order is cut off by a direct hit to our hull. The explosion fills the view screen and sends a red shirt flying into a bank of science stations. There’s no time to mourn him. The klingons are still firing, and our hull is dangerously close to falling apart. With the survivors safely transported into the ship, we plot a warp course for anywhere but here. The solar systems ahead of us smear into bands of light as the crew breathes a collective sigh of relief. The USS Aegis warps away to safety, payload intact. 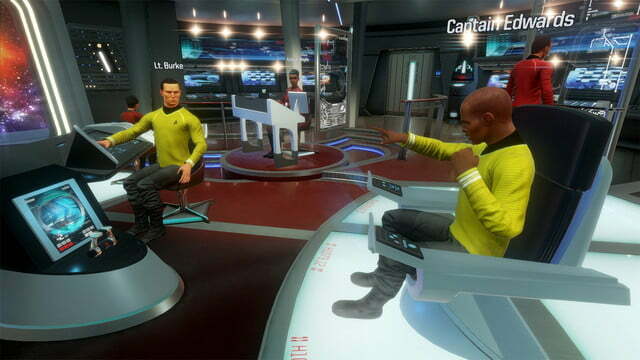 The Star Trek: Bridge Crew demo may be over, but our time with Starfleet is just beginning. One of the biggest differences between the HTC Vive and Oculus Rift at launch was the latter’s lack of motion controllers. With the Oculus Touch controllers inbound before the end of the year, it only makes sense that games will start leveraging the tech for more immersive titles. Bridge Crew is interesting in that respect, because you use the controllers, in our case the Oculus Touch, palm down, instead of upright like a standard game controller. You pull a trigger at the front edge to “touch” with your finger, tapping and clicking at the large virtual tablet that makes up your command station. It feels a bit like scratching at first, which becomes a natural movement for tapping a virtual touchscreen. Using different buttons, you can extend or close your fingers in order to shake a fist, wave, or even make rude gestures at your companions. We’ve seen a few games, like Hover Junkers, which feature similar tracking and hand control features, but here they’re integral to Bridge Crew’s gameplay. 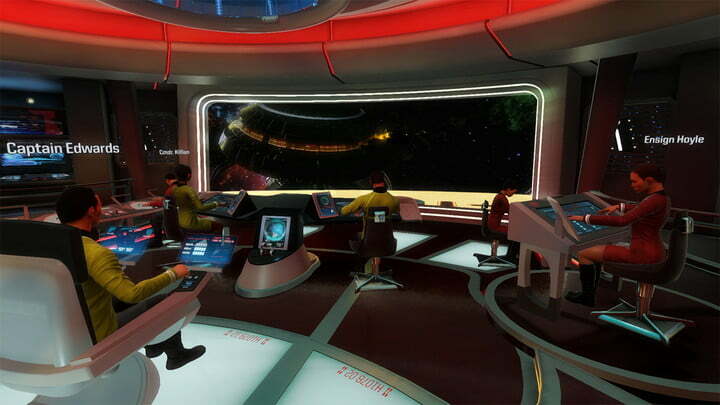 Combined with the perfect recreation of a (unfortunately Abrams-era) starship interior, this Trekkie title might just be the most immersive VR game yet. The one-to-one control scheme means operating your station becomes intuitive quickly, but there’s more to it than that. Each player takes on the role of different member of the USS Aegis’s crew, including engineering, helm, tactical, and of course, the captain. As the tactician, for example, you’ll be required to manage the shields, target and scan nearby objects and vessels, and fire on them if the situation calls for it. Of course, your weapons only work if engineering has devoted power to them, and your effectiveness will depend on cooperation from your other crewmembers. Operating your station becomes intuitive quickly, but there’s more to it than that. This interconnected, cooperative multiplayer propels Star Trek: Bridge Crew from solid idea to impressive execution. All four players have their own responsibilities and limitations, and all must work in concert to ensure the ship’s mission succeeds. The reliance on each other means the captain’s job is all too important. Their role requires instant recall of the ship’s features, its crew’s limitations, and the specifics of the mission at hand. Rather than following through on game mechanics or locking onto enemies, the captain’s job is communicating clearly and keeping the crew on the same page, while keeping an eye out for any surprises. Despite its futuristic premise and reliance on new technology, Star Trek: Bridge Crew relies on good old-fashioned human interaction to produce a compelling experience. If your friends are into Star Trek, that means shouting commands and arguing over protocol — a dream come true for trekkies. If you’d like to take a seat aboard the USS Aegis, you won’t have to wait long. The game will hit the HTC Vive, Oculus Rift, and Playstation VR on November 29th. You’ll be able to play the game with either a traditional gamepad or motion controllers, but the latter option is much more appealing. With access to both an HTC Vive and Oculus Rift, and regular conference attendance, we’ve been able to put hands on a ton of VR games. Only a small handful have the ability to pull you in and make you want to spend a few hours playing. 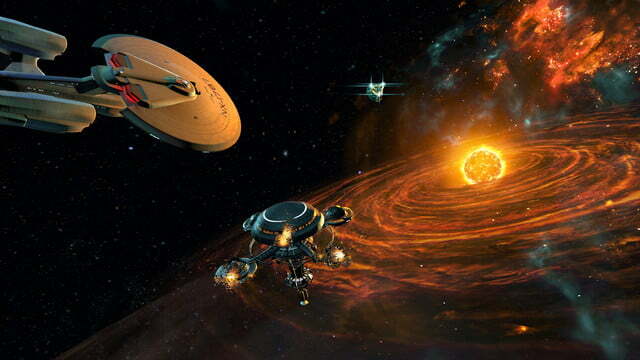 Star Trek: Bridge Crew is one of them. It’s not hard to imagine losing an entire afternoon living as the helmsman of Prometheus-class starship. The only problem – and it’s not a small one — is that you’ll have to convince your friends to buy headsets, too.